Larry is a former Air force artist with a degree in advertising illustration. His "found art" creations combine elements of Dada, randomness and chance. He's been known to utilize old inner tubes, toy cash register keys and even airplane parts in the creation of his work. His most recent creations are small collages supported by wire on a telephone bell base; also pendants, paintings, sculptures and lighted boxes reminiscent of Joseph Cornell. 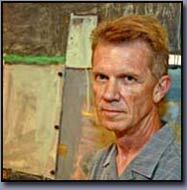 He has won numerous competitions and awards including the Michigan Great Artist and the Michigan Fine Art Competition. Larry has also participated in I/ACT's "Business of Art" seminar series. His two part seminar titled Marketing Your Art - The Power of Friends will be broadcast on Community Media Network in Oakland County, Michigan.